Below is a collection of short (3) question Pop Quizzes grouped into the various knowledge areas of the CSCS exam. The questions are relatively easy, and by no means are they exhaustive of the entire scope of the CSCS exam. They do however, represent a sample of the content, and failure to answer a question clearly indicates an area that needs further review. For an overview and examples of the types of questions encountered on the CSCS exam Please click here. 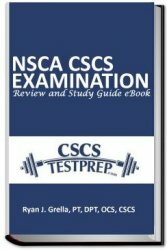 For 550 CSCS Examination multiple choice practice questions, please consider the NSCA CSCS Examination Review and Study Guide eBook. In addition, this eBook contains a review of all 24 chapters of the text Essentials of Strength Training and Conditioning, two simulated practice tests, and various other features. To learn more about this study guide, please click here.